Buy High Quality Graphene Oxide Products Online Today! Graphene Oxide is a 2 dimensional nanosheet of highly oxidized carbon atoms decorated with oxygen containing functional groups on it’s edges and basal plane. These groups provide for it’s legendary solubility, making it unique in the world of nanotechnology. We supply the high quality GO products below! Our prices are shown as price ranges. To find the price for a specific product and quantity, simply click thru to the individual product page and enter the quantity you need. Our website will display the price for that specific quantity. We recommend storing GO in a lab refrigerator to preserve it’s functionality. Ready to buy graphene oxide? Quotes are available online thru our cart. Simply add the products and quantities you need into the cart, calculate shipping, and click the “Quote or Buy” button. Get an online quote today! To find the price for a specific quantity, click the “select options” button, enter in the quantity you need and the cart will display the price for that quantity. Graphene oxide’s properties are unique because of it’s high surface area, functionality and two dimensional (2D) sheet-like structure. It’s highly oxidized carbon atoms are arranged in a honeycomb hexagonal lattice pattern. Individual flakes are typically nanometers to microns wide in the X & Y directions. Single layer GO is typically 0.7-1.2nm thick. The difference between graphite oxide & graphene oxide is the overall thickness of the flakes. Above 10 layers thick, materials are generally considered to be graphite, not graphene. It’s typically sold as a powder, dispersed in a solvent or polymer, or as a spin coated film. It’s easily dispersed in water, polymers, solvents, using ultrasonication or high shear methods such as a homogenizer. GO is electrically insulating but it can be made conductive by reducing it. The reduction process removes most of the surface functionality and restores the graphene lattice structure. Graphene oxide’s physical properties can’t be discussed without talking about it’s functionalization. GO typically has >40% oxygen groups, including OH, COOH, & Epoxide groups. This physical property enables graphene oxide dispersion in Di water, NMP, DMF, THF, Ethanol, and other polar solvents. When fully oxidized, graphene oxide is a light brown (tan) colored solid powder having a C:O ratio between 2.1 and 2.9. These properties give graphene oxide it’s legendary solubility and superior dispersion properties. Individual layers retain the structure of graphite but have a much larger and irregular spacing between them. 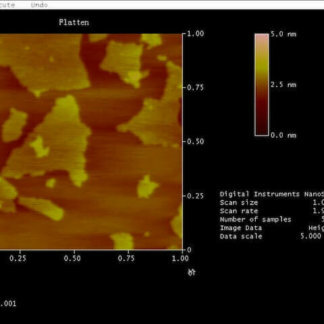 Flakes are typically hundreds of nanometers to tens of microns wide. 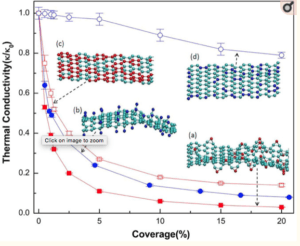 Although the graphene oxide’s electronic properties are not comparable to pristine (CVD or Epitaxial graphene) graphene due to structural defects from oxidation which disrupts the sp2 bonding networks. It can be reduced to improve graphene oxide conductivity and provides many advantages for real world applications. Additionally it can be paired with more conductive materials to boost conductivity. GO’s optical properties make it an optically transparent material. Although not fully transparent, optical transparency greater than 90% can be achieved with GO films less than 5 layers thick. Each graphene layer reduces transparency by about 2%. 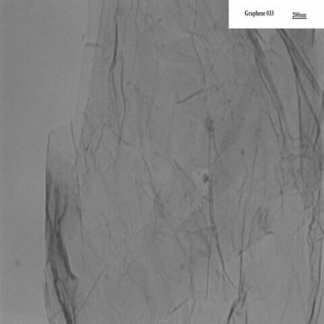 Transparent conductive inks and films can be made by combining GO with carbon nanotubes or silver nanowires. Graphene’s superior thermal properties have sparked great interest which is why graphene has been studied for thermal management applications. Single layer graphene has high thermal conductivity but data shows that adding just one more layer greatly reduces it’s thermal conductivity. Interlayer spacing has a significant effect on thermal conductivity meaning that the number of layers and the spacing between them can reduce the overall thermal conductivity. The thermal conductivity of graphene oxide is higher than bulk graphite with similar interlayer spacing. Increased interlayer spacing and the presence of oxygen groups enhances phonon scattering. It’s high thermal conductivity can be attributed to increased interlayer coupling due to covalent interactions provided by the oxygen atoms. The relationship between thermal conductivity and the coverage of (a) oxygen adatoms (red line with solid red square); (b) hydrogen adatoms (blue line with solid blue circle); (c) mass defects mimicking oxygen atom weight (red line with open red square); (d) mass defects mimicking hydrogen atom weight (blue line with open blue circle). Research shows that GO’s thermal conductivity is directly related to the amount of oxygen groups present. At 0.5% oxygen groups, the thermal conductivity of GO is ~50% less than pristine graphene. As oxygen content increases it’s thermal conductivity decreases. The minimum thermal conductivity of GO realized in journal articles is about 8.8 W/mK which is lower than the theoretical minimal thermal conductivity of 11.6 W/mK. This suggests that we can tailor the thermal transport in graphene oxide by controlling oxidation and reduction. 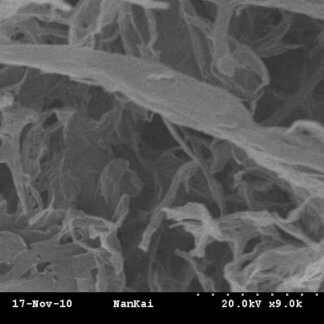 Graphene oxide’s mechanical properties are much lower than pristine graphene. 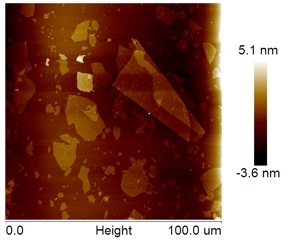 Monolayer graphene oxide has a lower effective Young’s modulus (207.6 ~ 23.4 GPa when a thickness of 0.7 nm is used) as compared to the value reported for “pristine” graphene which has a Young’s modulus of ~1.0 TPa and the ultimate breaking strength of ~130 Gpa as reported by Lee et al. The properties are reduced due to the defects in the graphitic structure formed during oxidation. Reduction of GO can improve mechanical properties and restore the graphitic structure. GO’s high solubility in many solvents and polymers enables the solution processing properties of graphene oxide. It can be spun, dipped, or coated onto a substrate using slot die, screen, gravure, or other printing methods. 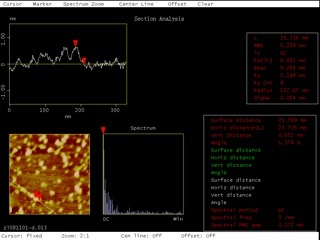 It can be patterned and reduced with a laser, even using a DVD writer in a PC has been shown. Graphene oxide’s history goes back over 150 years! It was originally called graphite oxide it was first prepared by Oxford Universities chemist Benjamin Brodie in 1859 by exfoliating graphite flakes with potassium chlorate and fuming nitric acid. William Hummers and Richard Offeman developed the Hummers method in 1957 making the process faster and safer by using sulfuric acid, sodium nitrate, and potassium permanganate. This process is still being used today with some modifications to minimize environmental and safety concerns. One such modified Hummer’s method is the Tour method. A modified Hummer’s method synthesis method is typically used to make GO from graphite in chemical process by treating graphite with strong oxidizers such as potassium permanganate, hydrogen peroxide, sulphuric and hydrochloric acids. This chemical process exfoliates the graphite into single or few atomic layer sheets, expands the interlayer structure, and adds the functional groups. The type and amount of oxygen containing functional groups makes graphene oxide hydrophilic which means that it’s water soluble. Originally called graphite oxide, Graphene oxide synthesis involves reacting graphite with strong oxidizers, typically potassium permanganate and sulphuric acid, and is rinsed and centrifuged until the rinse water filtrate is PH neutral. Then it’s freeze dried to preserve solubility. Some producers even use dialysis in the purification of GO. When GO is contaminated by alkaline salt byproducts generated during synthesis, it becomes highly flammable due to salt catalyzed carbon combustion. Our GO is highly purified and flammability isn’t of concern. The bulk product is a brownish/yellowish solid material that retains the layer structure of graphite but with a much larger and irregular spacing. 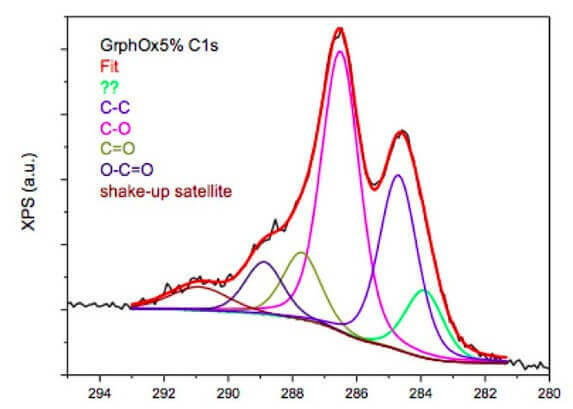 There are four common graphene oxide synthesis methods: Staudenmaier, Hofmann, Brodie and Hummers. Variations of these methods exist, including the Tour method, a modified hummers method. It’s synthesis is constantly being studied and improved to provide a more consistent quality, reduce environmental concerns, and reduce costs. The oxidation process is typically evaluated by the carbon/oxygen ratio, >40% is considered acceptable. Graphene oxide applications include catalysis, drug delivery, solar, battery, tissue scaffolding, water desalination and many other areas. It’s high solubility and ability to be reduced enables solution processing, making it a desirable nanomaterial. GO overcomes the well known dispersion problems associated with other carbon nanotubes. Electronic devices have been fabricated using GO as a starting material for at least one of the materials. Field effect transistors have been fabricated using RGO as well as chemical sensors and biosensors. Transparent electrodes in the visible range of light are important for light emitting diodes (LEDs & OLEDs) and solar cell devices. In addition to transparent electrodes, RGO has been used as a hole transport layer. RGO nanocomposites have been used for high capacity energy storage in lithium ion batteries. Electrically insulating metal oxide nanoparticles such as Fe3O4 or Fe2O3 can bond onto RGO and increase it’s performance in batteries. The energy storage capacity and cycle stability has been shown to increase when Fe3O4 is bonded onto RGO versus pure Fe3O4. High surface area GO has been synthesized using microwaves for exfoliation and can be reduced. The high surface area RGO is also used for energy storage material in supercapacitors. Studies have indicated that GO’s biocompatibility is good, paving the way for it’s use in drug delivery. It doesn’t induce oxidative stress because it’s preparation doesn’t involve metal catalysts and avoids metal impurities unlike other carbon nanomaterials such as carbon nanotubes (CNTa). The functional groups on the surface allow successful interaction with a wide range of organic and inorganic molecules by covalent, non-covalent (π-π or hydrophobic) and/or ionic interactions. This enables the use of GO for drug delivery applications. The 2D structure of Graphene oxide is shown above. The type and amount of functional groups present give GO it’s legendary solubility compared to other nanomaterials. Surfactants aren’t needed when dispersing into polar solvents such as Di Water, NMP, DMF, THF, DCB, Ethanol, polymers or others. Graphene oxide’s chemical formula and molecular weight are below. 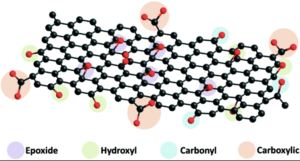 Reduced graphene oxide is synthesized as regular GO and then reduced. Reduction removes the surface functionality and restores the molecular structure to one closer to pristine graphene than GO. Reduction is typically a chemical, thermal or electrochemical process. Other techniques are able to produce very high quality rGO, similar to pristine graphene, however it can be complex and time consuming to carry out. Chemical reduction is a highly scalable method but the surface area and electronic conductivity achieved typically isn’t high enough for many applications. Heating GO to temperatures greater than 1000℃ creates RGO which has a very high surface area but the annealing process damages the structure when pressure builds up and carbon dioxide is released.The reduction process can reduce it’s mass by ~ 30% and improves its electronic properties. Electrochemical reduction has been shown to produce very high quality RGO, almost identical in terms of structure to pristine graphene but can be slower than other methods. RGO can be selectively functionalized, enhancing its compatibility with the solvent/matrix or to create new compounds when combining RGO with other two dimensional materials. It’s surface chemistry can be tailored for compatibility with the application. Graphene Oxide’s price is determined by production volumes and degree of purification. Most of products are between $75-225/g but some variations cost $450/g. Our products are washed and centrifuged 15 times until the filtrate is pH neutral. Then it’s freeze dried to preserve solubility and stored in a refrigerator. Not all suppliers take these steps. This process costs more than processes used by companies that sell GO in solution with a low pH. The low pH is because they’ve reduced the washing and centrifuging cycles and its an acidic solution. GO’s shelf life is about 6 months before functionality begins to decrease however it can still be used longer. We recommend storing it in a lab refridgerator. First we must establish what is graphene or graphite. It is generally accepted that 2D sheets that are less than 10 layers thick can be called graphene. 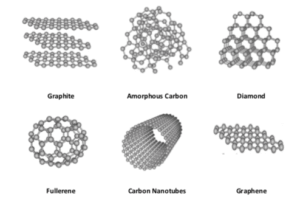 There are 3 main types of graphene: Graphene films which are typically made by CVD, ALD, or Epitaxial growth, Graphene Oxide which is exfoliated by reacting graphite in sulphuric acid with potassium permanganate in a highly exothermic reaction, & Graphene Nanoplatelets which can be plasma exfoliated or chemically exfoliated, ball milled, or thermally shocked and sheared to product stacks of graphene nanoplatelets. How to chose between graphene and graphene oxide? It depends on your application. If you want electronic properties to make a sensor or device or improved mechanical properties, we recommend CVD graphene, or RGO. If you want good dispersion and solution processing, we recommend normal GO. Graphene oxide membranes are relatively easy to make with vacuum or pressure filtration. GO’s known to disperse very easily due to the functional groups on its surface. To make a GO membrane, first we disperse it in a solvent such as water or an organic solvent and then using a 0.2um membrane filter, pour the solution through a filtration apparatus, and the filter keeps the particles on top while the solvent is collected below forming the membrane on top of the filter. When dry, the membrane can be removed leaving a free standing membrane paper like product. Please see our Graphene Oxide Safety Data Sheet (SDS) GHS Compliant. Dispersions are available from Cheap Tubes Inc. Please let us know your requirements such as solvent and loading ratio. Our standard concentration is 2mgs/ml but we can go up to 10mgs/ml. Below are some publications that used GO from Cheap Tubes Inc.
GO’s elemental analysis typically shows a higher oxygen content than carbon content with small amounts of hydrogen. We can provide dispersions In Di Water, NMP, THF, or DMF. Hazmat shipping fees may apply. GO and RGO coatings are available with the specifications below.